For many, earning a doctoral degree is the final destination on an educational journey. But for Chicagoland native Greg Bereiter, it signals a new beginning. Bereiter, who is soon to be a newly-minted Ph.D., began a career as a federal historian in December with the Naval History and Heritage Command in Washington, D.C. Working as a historian is an ambition that has been with him since his undergraduate days, and helped him advance through his doctoral program in seven experience-filled years. “Technically, I’ve been in graduate school at NIU since 2007 when I started my master’s degree,” he said, adding that he started working on his doctoral degree in Fall 2009. But before he could attend graduate school, Bereiter needed to fulfill a commitment to Uncle Sam. Bereiter went on active duty three weeks prior to 9/11 and served during a perilous time in U.S. history. While stationed at Fort Irwin, Calif., he helped train soldiers for deployment overseas. His regiment stayed intact until late 2004, when two thirds of his comrades were deployed to Iraq. After fulfilling his active service commitment and receiving an Illinois Veteran Grant, Bereiter began work on a master’s degree in history at NIU. “The grant has been a huge help in financing graduate school,” he said, adding he has also benefitted from working as a graduate teaching assistant. His first graduate-level class – Religion in Early Modern Europe – proved to be an epiphany. The class professor, Brian Sandberg, would become Bereiter’s mentor and, eventually, his dissertation adviser. Under Sandberg’s tutelage, he was a three-time participant in the University of Geneva’s Institute for the History of the Reformation summer doctoral seminar, served as a Graduate Scholar-in-Residence at the Newberry Library, and was awarded a prestigious year-long Chateaubriand Fellowship from the French government. “I applied twice for the Chateaubriand Fellowship – and I got it on the second try,” he said. While he conducted full-time archival work in Paris, Bereiter’s research also took him outside the city to numerous municipal and departmental archives. In addition to the research experience, the opportunity to network and build relationships with researchers with similar interests was invaluable. “It opened countless doors,” Bereiter said. 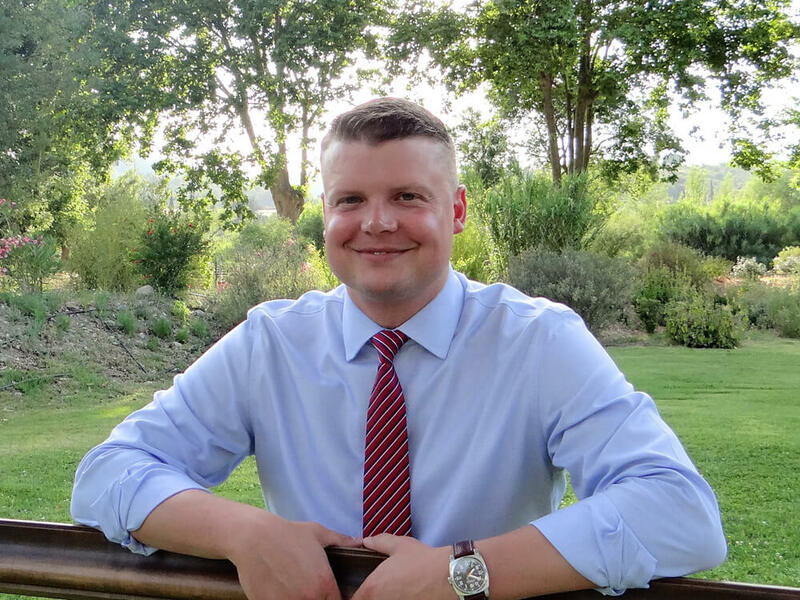 While finishing his dissertation, another door opened – this time with the Naval History and Heritage Command (NHHC), where he works as a research historian. 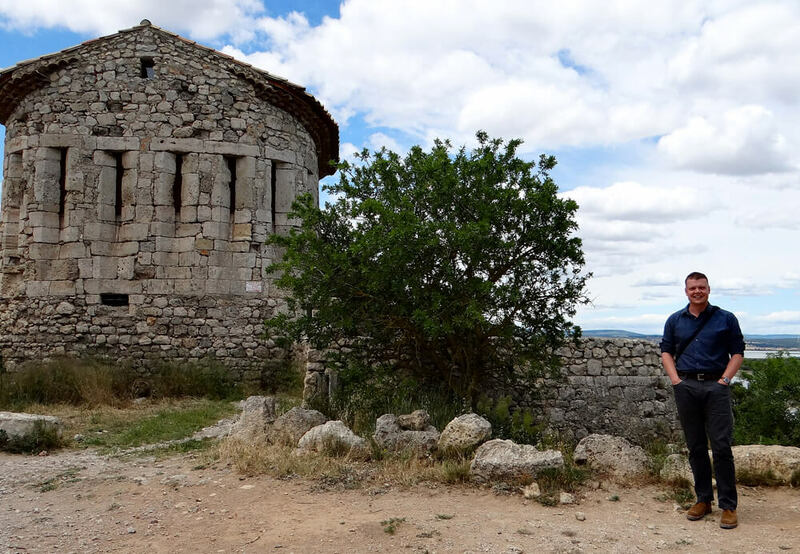 Greg Bereiter near Leucate, in southern France, during the final stages of his dissertation research. His main focus at NHHC is researching and writing about post-9/11 naval operations, transcribing French documents for the Naval Documents of the American Revolution series, and providing historical support to the Office of the Chief of Naval Operations. While serving as a full-time historian at NHHC, he continued to work on his dissertation at night, on weekends and days off, often utilizing the Folger Shakespeare Library. Then, on March 24, he successfully defended his dissertation. Looking back, Bereiter doesn’t regret chasing his dream and encourages students to pursue their interest in history.